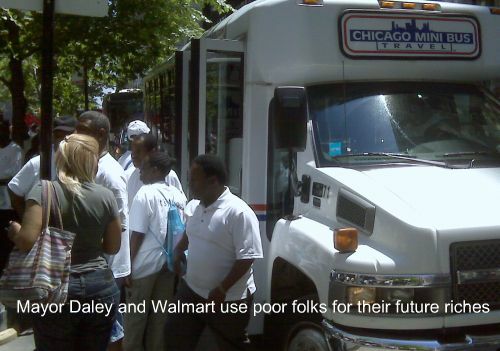 Mayor Daley and Walmart pay poor Chicago Folks to march in downtown Chicago. Thanks to Mayor Daley’s wild spending and Chicago’s massive debt, Daley sold out to Walmart. Many poor black folks were paid to march downtown Chicago today. This helped many white folks feel very guilty. The marchers got a clean white shirt and a loose promise to make just over minimum slave wage for a bunch of white multi-billionaires. Mayor Daley and the alderman did not make a single penny off this deal. 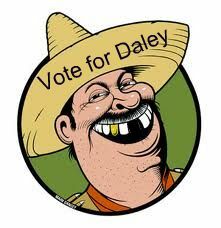 (Joking) According to published reports, Mayor Daley got the wheels in motion because he really cares about his black servants. The black reverends served up the brothers for very little money. One black guy told me this is going to change his life working for Walmart. He told me he is going to buy a Caddy or a Lexus. I wonder what year? Chicago is going down the toilet faster than I thought. Photo by Patrick McDonough. I am a union plumber and proud of my trade, though I’ve been laid off for 21 months. I and every other union plumber out there went through five years of apprenticeship, and we work very hard to earn that money, whether that’s rodding out sewer systems, plumbing single-family homes or 95-story high-rises. We do the work that you don’t want to or don’t know how to. It’s a skilled trade, and you pay for that skill. Without qualified plumbers and the plumbing inspectors, everyone’s health could be put at risk through improper water connections or sewage disposal. Instead of complaining how much a plumber makes, next time thank him for providing safe drinking water for you and your family and for getting that razor out of your sewer that you flushed down the toilet so your home isn’t backed up with raw sewage. Former Ald. Ed Vrdolyak gets caught trying to steal million-plus dollars. He gets a couple of football players to write the judge a letter. He walks. Former Streets and Sanitation Commissioner Al Sanchez, convicted of fraud in a City Hall hiring scheme, waits around long enough and finds a judge to reverse his conviction. City plumbing inspector James Kendrick, working without a permit and using city materials for free, gets his job back. A reputed made man in the mob, now behind bars, finds a judge who grants him the OK to go to a top-notch restaurant on Christmas Eve. My money says Blago walks.